So much for all that free health care. Many in the media have blamed Venezuela’s worsening humanitarian crisis on corruption, mismanagement, falling oil prices, or U.S sanctions—anything but the rise of socialism in what was once the wealthiest country in South America. Whatever any government anywhere’s plans for the future, keeping the price system in place is of paramount importance. The citizens rely on the government for their livelihood, but they have little control over the government that supposedly represents them. It’s time for the American left to explain why the tragedy of Venezuela will not happen here if their policies are enacted. The Maduro regime is showing an alarming willingness to violently attack opposition leaders, and it’s moving in on high-profile ones who had previously seemed untouchable. They’ve already jailed politician Leopoldo Lopez and driven many others into exile. But the regime’s people have stepped up the thuggery to higher levels since then. They tortured to death a city councilman who was then flung off a ten-story building earlier this month. And they encircled and beat up leading opposition leader Maria Corina Machado, likely signaling intent to kill. Its people are fleeing not war, famine, or natural disaster but economic mismanagement. Socialism and electricity don’t seem to mix in Maracaibo, Venezuela, where a humongous string of power substation explosions occurred on Aug. 31. Nice work, socialism. A researcher at John Hopkins who has been tracking prices in Venezuela for two decades, says that the inflation rate has topped 40,000% for the first time. No, that’s not a printing error. Venezuela’s tragic famine and refugee crisis taking place despite the largest proven reserves of oil on the planet. As the US bails out Venezuela’s refugees, why isn’t it condemning the horrors of socialism? With 35,000 hungry, desperate Venezuelans pouring over the Colombian border every day now, Venezuela has morphed from a socialist nuisance state with a big-mouthed dictator into to a very real foreign aid issue. The desertion of an army over hyperinflation doesn’t seem to have precedent for success. Few in Washington appear worried about how instability in Latin America will negatively impact the political order of the United States. Once the region’s richest country, now a leading producer of refugees. Venezuela’s continuing economic collapse is a horrifying condemnation of how socialism actually works. Prior to any discussion on what to do about Venezuela, a consensus about what led to this crisis needs to be reached. A very bad situation keeps getting worse. Kudos to The New York Times—yes, The New York Times—for running an excellent, detailed story on the mass starvation and economic catastrophe taking place in Venezuela. Alas, missing from the Times analysis is nearly any discussion of the reality that Venezuela is a socialist country once praised by America’s liberal elite. So much for socialism helping the poor. The Financial Times has an excellent interview with economist Ricardo Hausmann on the Chavez and Maduro-created tragedy that is Venezuela. HT2 Timothy Taylor, aka, the Conversable Economist. Socialism is why Venezuela’s economy is so much worse than other oil-dependent nations. A video from Prager University. Philosophically consistent Democrats, if given enough power for a long enough period, would likely destroy the U.S. economy in much the same way the socialists of Venezuela have. Maduro’s regime seeks to establish a one-party state. It’s worth noting that the American Left praised both Chavez and Maduro for decades as halcyons of humanitarian redistributionism. 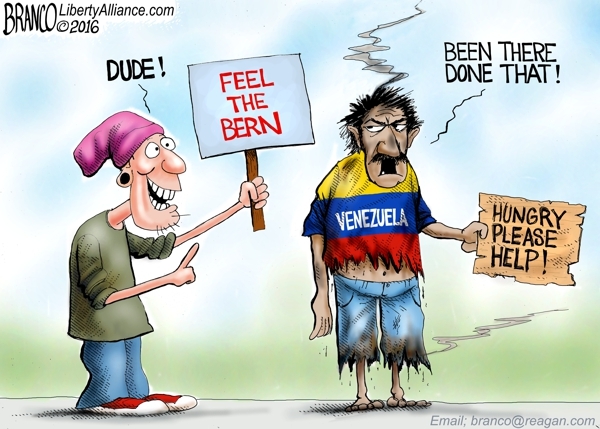 [I]n a country where many young people are still enchanted by the Bernie Sanders message of socialism and free stuff, not enough attention has been paid to this simple fact: that in the real world—a world where bad people say good-sounding things to voters and then proceed to steal other people’s stuff once they take office—Venezuela is what you get when socialist theories are actually put into practice. Venezuela’s money, the bolivar, is sinking faster and faster under an intensifying political and economic crisis that has left citizens destitute and increasingly desperate. Venezuela is a woeful reminder that no country is so rich that it can’t be driven into the ground by revolutionary socialism. Hyperinflation, food rationing, failed government-provided services are just a few of the endemic problems. The opposition fights President Maduro’s power grab as Trump administration imposes sanctions. Tragedy and farce: The people starve, the attorney general denounces the government, and a Maduro loyalist hides in the trunk of a car to sneak into the Ministry of Justice. Everyone Wants Toilet Paper. Why Doesn’t Venezuela Have Enough? The don’t have enough food, either. Venezuela is one of the most unreported tragedies of our time. The country is a human rights disaster of poverty, corruption, misery and epic mismanagement. 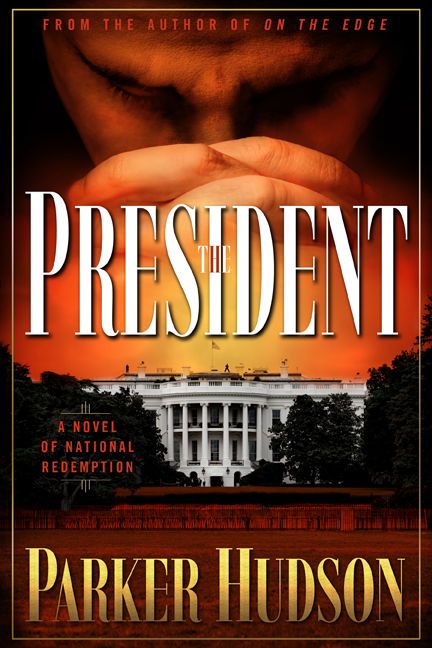 Its descent into dictatorship, civil war and chaos demands an immediate response. More than fifty days after mass civil disobedience began in Venezuela, more than 50 people have died at the hands of the government. If you want a simple test to determine if a news source is in the fake news business, examine what it writes about Venezuela. As the world watches with horror, the crisis in Venezuela continues. Massive anti-government protests reach a tipping point. The deepening economic crisis has left Venezuelans without basic necessities such as medicine and food, leaving Venezuelans sick, hungry, and desperate for change. Two days ago, the death toll in Venezuela’s gargantuan protests stood at three. Now it’s jumped to 20. We have all of the components of an unfolding humanitarian disaster on display in Venezuela. It appears that Venezuela is on the brink of collapse as it enters the fourth circle of statist hell. Not too long ago, oil reserves and natural resources made Venezuela the richest country in South America. VIDEO: Do Venezuelans Love Socialism? American Democrats love socialism. 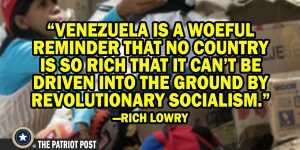 Filmmaker Ami Horowitz spoke with a few of them before heading to Venezuela to find out how well socialism is working out for people there. The answer is, not so well. Three quarters of the population has lost an average of nearly 20 pounds in body weight. The country’s imminent collapse will have far-reaching implications for the region. Why are they seeking asylum? It starts with a failed state, a country that does not work anymore. A desperate regime goes into propaganda overdrive. Maduro government turns to stealing currency from its impoverished citizens. Scattered looting as population is stuck with voided 100-bolivar notes. Once citizens taste the fruits of capitalism in freer countries, there is no turning back. Venezuela’s price inflation is and has been the highest in the world for three years. It seems the “Socialism of the 21th Century” is really no different from socialism from the past. John Lennon’s ‘Imagine’ gave us a fantasy vision of socialism. Venezuela is showing us the brutal reality. Food, medicine, toilet paper, and electricity are vanishing. Image credit: Cartoon by A.F. Branco.